Come on everybody it's parachute time! Tabby goes to Gymboree classes once a week. Now, you might ask, what do 10-month old babies do in such a class. Plenty! The baby and parent sing and do movements to increase the baby's cognitive intelligence and improve physical coordination. Tabby loves parachute time. 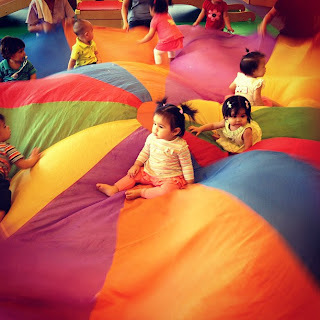 Babies sit on the parachute as teacher blows bubbles.